Anne Judell “Void” – Review. Anne Judell. “Void”. Janet Clayton Gallery, 2 Danks St. Waterloo NSW 2017. 10th September-4th October 2014. Anne Judell is a quiet presence in Australian visual arts. Her public profile and challenging works are seldom out front in the hurly-burley of the contemporary art scene. Even those who deeply appreciate her achievements struggle to articulate what it is that compels and enchants them. I spend half my life closely observing the natural world. The other half I spend in the studio, attempting to translate this experience into two-dimensional form. I am always drawn to the minutiae exposing the evolution of form. 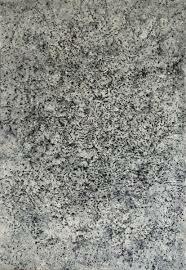 Fragility, intimacy, cycles and sequences are what interest me, as opposed to the heroic and the sublime. (Judell 2005). Judell’s work requires time: time to produce, and time to view, to sit with it quietly and let the subtle effects engage your consciousness. A somewhat noisy gallery is probably not ideal. The initial impression can be puzzling. What are we looking at here? A comment by Stella Rosa McDonald is offered to gallery visitors. She speaks of comparisons and similes, suggesting that Judell may have “figured out how to hit pause on the universe”. A lengthy interpretive essay by Luke Davies goes straight to quantum physics and Heisenberg’s uncertainty principle, seeing Judell’s work as embracing a negative capability, a border-zone between abstract and figurative, the felt and the known, the seen and the heard, the physical and emotional. 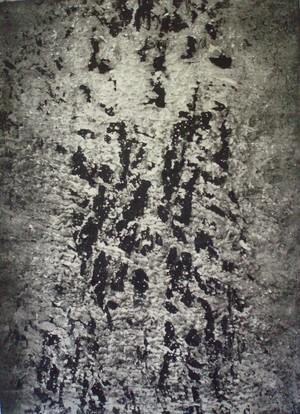 Davies speaks of meditation and trance, suggesting that her work offers “portals” into another frame of experience, between “outward expansion and inner compression”. These are strange claims for works created in small scale on paper. Such works are often associated with a feminine delicacy, and certainly Judell refuses the usual apparatus of heroic masculine art. Yet this work is far from gentle or decorative. The mixed media works have something of the visual impact of the older indigenous desert women’s dot paintings, without the colour field. Designs and suggestive associations emerge from dense marks which offer many possibilities. 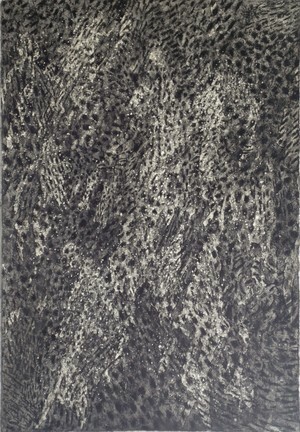 Nos 18 and 19 especially have an animal quality, reminiscent of fur or scales. Others might be reflections of the surfaces of tree-bark or the earth itself. Strong, deep shapes emerge without warning. Paleness, greyness, hints of blue, dark stripes in stipples, “Glory be to God for dappled things” (Gerard Manly Hopkins). We could be traversing roads, mountains, depths of earth, the night sky, the infinite universe, maybe even the reflection of stars in different galaxies of darkness. And there is the “thump” of Rothko, especially the Houston chapel works. It may seem an odd comparison, the grandeur of Rothko’s huge paintings and these seemingly modest works on paper. But in both cases the longer you view the more a sense of shimmering depths and a shuddering emerges, almost as if we are at the edge of emergent Being itself. The title of the show, “Void”, points directly towards this philosophical realm. More than just a cute title, the idea of the Void has been emerging recently into a new significance for metaphysics, artistic and creative expression, and in scientific debate around the nature of human experience. The idea of the Void is usually seen as a manifestation of nothingness, associated with the contemplation of emptiness. An awareness of a void at the centre of phenomenal existence has long been central to Asian metaphysical traditions. In the Heart Sutra, “form is emptiness and emptiness is form”. The idea points towards an apprehension of a whole reality, before it is sliced up into concepts, especially via the effects of language. Yet the Void also points to a presence, rather than a lack of it, involving particles and antiparticles erupting into being, a constant hidden dimension of which we are usually unaware. Artists have tried to point in this direction: Alberto Giacometti’s Hands Holding the Void (Invisible Object) 1934 was an early example, while Yves Klein’s Leap into the Void 1960 tried to capture the sense of something in nothingness as the human body engages with space and gravity. Recent research at the University of Ljublana, Slovenia brings together the need to redefine the problem of the Void, in particular the idea of the generation of “something” and ultimately of Being and the universe. Empty space, it turns out, is not empty but the seat of the most violent physics. The theory of relativity and quantum field theory have altered our understanding of the fabric of physical reality, in which the void becomes the key element in the structural functioning of existence itself. Heidegger, in his essay “The Thing” (Das Ding) poses the void as the deep essence of thing, as opposed to its manifestation in the form of material objects as such. Ann Judell’s work seems to be guiding us towards these unsettling perceptions. The limitations and potentials of the human body, the vision system and its links into the sub-microscopic level of cells and life-forms are called into action in the contemplation of her work. It is as if she is telling us to Be carefully and cultivate our own awareness of the absolute mystery behind everyday existence. Anne Judell, Moonlight 3. Mixed Media.